The principles to apply when considering whether to allow an application under 6.15 (service of the CF by alternative method or at an alternative place). The evidence in support must explain the failure to serve. A Claim Form (“CF”) which had been issued on 18/12/13 was sent by fax to the Defendant on 3/3/14. This was sent for information purposes only, and it was common ground that it had not been served. A subsequent consent order provided that the CF would be served upon the Defendant by 4pm 3/4/14. However, the CF was infact served on the Defendant’s solicitors by e-mail on 3/4/14, and a copy placed in the DX for next day delivery to the solicitors. The Defendant’s solicitors had not indicated that they were prepared to accept service by e-mail. An application was made to extend time to serve CF, pursuant to 7.6(3), 3.9, 3.10, 6.15 and/or 6.16. The witness statement in support gave no explanation as to why service had been attempted by e-mail. 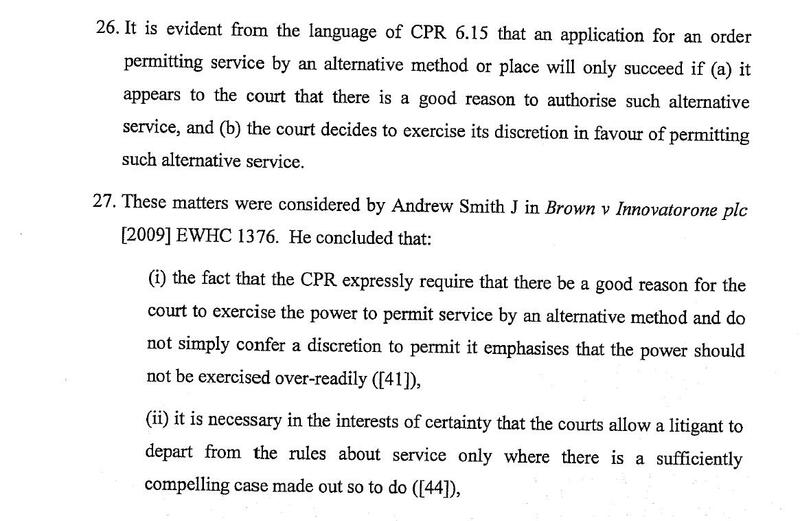 There was an appeal from the FI decision to grant permission pursuant to 6.15 (service of the CF by alternative method or at an alternative place), it being agreed that there had not been good service. It was accepted that one of the purposes of service of the CF was to communicate the contents to the Defendant, but another purpose was said to be to give parties certainty. It was held that the Master at FI had fallen into error by not considering why he was being asked to make the order. If he had, he would have realised that no explanation had been forthcoming. It is not good enough to ask the court to infer that it was due to a mistake. It was found that there was no good reason to make an order. 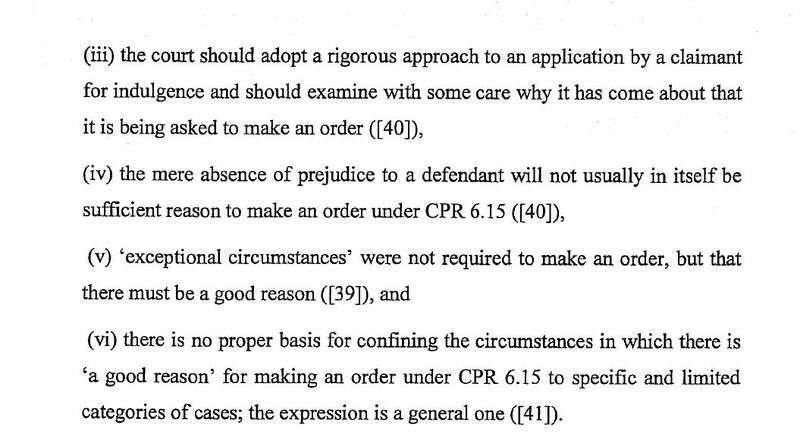 In case the court was wrong, the discretion would not have been exercised in any event because (i) there was no explanation from the Claimant as to why the CF was not served, and (ii) the prejudice which may be caused to the Defendant by denying it a Limitation Defence.